‘Google it’ and you’ll find hundreds of thousands of options and information sources in seconds. Studies show the first spot on Google’s search results page will claim 32.5% of all click through traffic, while the bottom spot only receives 2.4%. We know it’s one of the most powerful business tools, but also an extremely competitive place to be found. Whether you’re an online business or a physical store, Google’s My Business is a free listing site that allows you to provide important information details to your customers about your business. When you sign up to My Business your profile information is automatically transferred across the rest of Google’s tools, such as Maps, Google+, AdWords and Google Shopping. Create a new listing here with your contact details, address, opening hours and business category. Add photos. Upload all images you’d like to be associated with your business, profile pictures of you and team, logo and if you are a physical store, take pictures both inside and outside your store. Reviews. Your listing will also have customer reviews and ratings visible. To kickstart your page, ask your loyal customers, family and friends to leave the first reviews. High rating, numerous reviews will increase your business’s rank on Google. Confirm your business. Google will send you a postcard with a verification code, just to double check you haven’t entered incorrect address. Refine and add all the important information. Remember, a more complete profile will ensure a higher rank, so go above and beyond and ignore the ‘less is more’ mentality. Being on My Business will instantly add your business to Google Maps. Since 2014 searches in Google maps for “near me” and “nearby” have doubled, increasing the chances you can be found. Lots of websites, social media networks and databases also integrate Google Maps so people can publicly ‘check in’ to your business location and share on this on their social media channels. Not sure this sentence makes sense? Maybe just mention that getting on Google Maps allows people to check in to your business and share it on their social media channels. Click here and search for your business. Edit and confirm the information provided by your existing My Business account. Fill in your delivery details. Here you can decide whether your business caters to your customers internationally, nationally or locally. Revise, confirm and carry on! Circles allows you to share content publicly or privately in a selected group. You could use this to share content around specialised topics and prompt conversation and feedback. Hangouts allows you to chat, message and video call people from your account. You can host a ‘hangouts’ with up to 15 people at a time. This could be used a way to run virtual meetings, connect with your loyal customers, or run a focus group. +1 Button is similar to Facebook’s ‘like’ button. You’ll be able to see which of your posts are receiving the most attention at what time of day and by who with the Analytics feature. As with any social network, planning, writing and publishing will take time and resources. We suggest investigating whether there’s a community on Google+ you’d like to join and connect with, and making sure you know what you’d like to get out of that. Unbeknownst to some, YouTube is the world’s second largest search engine (owned by Google), and receives billions of views each day. YouTube works in the same way as Google in the sense that it uses keywords to rank results and responds to popularity of content. Tutorials & How-to: engage your customers with informative videos. For example if you’re a baker, capturing some of your favourite icing techniques will educate your audience and also expose your business to more people interested in baking and baking products. Q&As: Share your industry knowledge. Answer questions you commonly get on the job in a video. For example, not everyone will know the best stretches to do before a series of sprints, so if you’re a personal trainer, tell them. Behind the scenes: let people know where, how and what it is you do to run your business. This will let you flaunt your business’s personality and connect with your audience. Google AdWords is a service where you can pay to run an advertising campaign to target keywords that your customers are searching for. You can tailor the timing, location and language of your ads to ultimately land yourself higher on Google search results. This is a paid service, that works on a pay-per-click basis, so you’ll need to put aside some budget before you start. Try typing in a product, e.g. 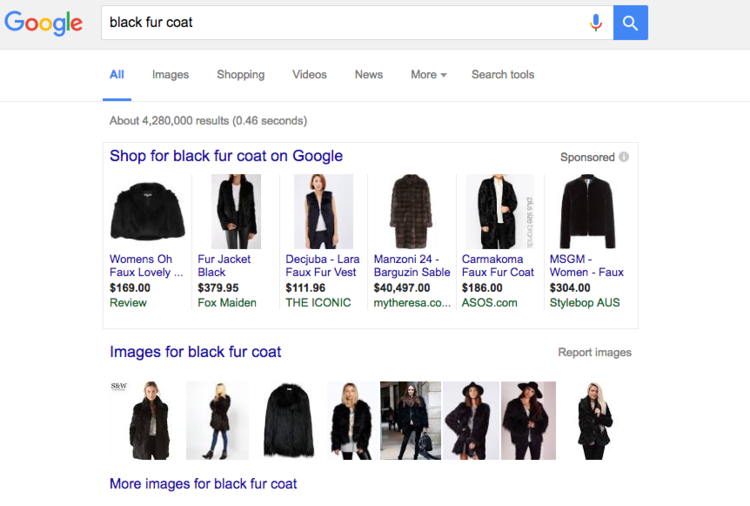 “black fur coat women” and you’ll see various options pop up from different retailers at the top of your search. This is what Google shopping does, allowing you to list and sell your products from the search results. This is also a paid service, connected through your AdWords account, and allows you to begin sales campaigns in your select country with the option of selling products online or informing customers of where they can purchase them in store. You may have noticed Google snippets or ‘answer boxes’, as the white information box that drops down when you type in a question. Snippets works by taking information from a selected website that concisely answers commonly Googled questions and can help you gain traffic to your site for being a well respected source of information. Studies show that in an average 10,000 searches, pages featured by snippets will receive 37% of clicks, while the first listed item without a snippet, will only receive 17%. Identify: The most common questions your customers might ask about your product or service. For example, if you’re a seamstress things like “how to fix a broken zipper” are often searched on Google, so leverage your industry knowledge to provide searchable answers. Wording: Use of correct keywords is vital, especially in your article’s headings. Using headings that incorporate instructions into them, like ‘how to’ will increase your chances of featuring as a snippet as they respond to commonly search queries that snippets is designed to answer. Length: Snippets provide brief information sources and display a short paragraph at the top of the page. Using between 54 - 58 words is ideal, however, if your content can be explained in a procedure, snippets also takes the first few steps and heading to feature. So now you’re ready to compete with the crowd and increase your chances of appearing on Google.